If you’re looking to sync only contacts between iPhone and Google, and don’t want to use the free Google Sync wireless service, use the built-in sync feature in iTunes. 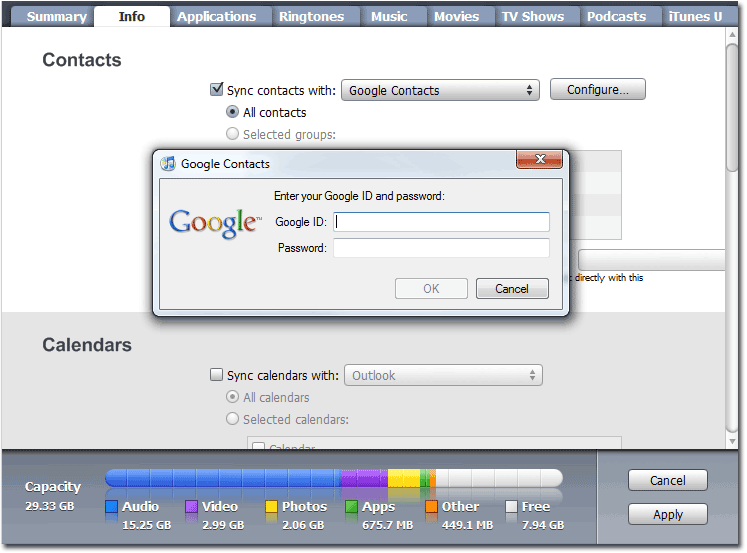 The latest versions of iTunes have the option to do a USB sync of Google contacts with iPhone. If you’re looking to do a USB sync of Google calendar with iPhone, CompanionLink can help. This entry was posted in CompanionLink Products, Tips and Tricks and tagged google contacts iphone, usb sync google contacts by Rushang. Bookmark the permalink.